The West Windsor-Plainsboro North boys lit up the track at Aggie Stadium on Sunday by running one of the fastest times in state history to win the 4xmile relay at the New Balance Nationals on the campus of North Carolina A&T in Greensboro, N.C.
WW North's winning time of 17:19.69 is No. 3 in state history and No. 19 in U.S. history. The 17:19.69 is the fastest time for New Jersey team in 45 years! Only Essex Catholic, 17:12.2 in 1966, and Paramus Catholic, 17:12.6 in 1973, have run faster. Senior Matt SantaMaria led off for WW North with a personal best of 4:19.67. Sophomore Luke Johnson followed with a PR of 4:15.68. Junior Vedang Lad then ran a 4:27.51. 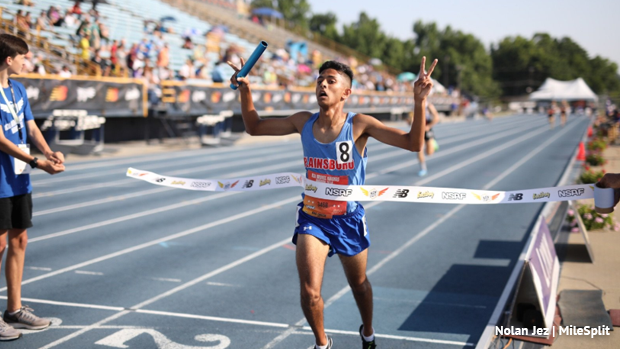 Lad handed the baton off to senior Atharv Kulkarni in second place, about a second behind the Jungle Track Club of Virginia. But Kulkarni, who split 4:16.75, immediatley seized control of the race as he shot to lead and methodically pulled away for a seven second victory over the Deluge Track Club of New York. Princeton, with Will Hare anchoring in 4:16.59, placed fifth in 17:33.92. Kingsway, which received a 4:18.57 leadoff carry from Stone Caraccio, finished 12th in 17:52.30.